Britain needs to prepare for a world in which driverless cars interact with manually-driven vehicles, a group of MPs have said. Self-driving vehicles could take to UK roads within the next 10 years but the country is not ready yet, the Commons transport committee heard. Issues over who is responsible in the event of a driverless car crash have yet to be resolved, Labour MP Louise Ellman said. The committee’s report also warned Britain risks falling behind the rest of the world if its laws do not adapt to advancing technology. The motor industry is poised to undergo rapid change over the next decade, as tech giants such as Google and Apple have spent several years investing in driverless car technology. However legislation in the UK is failing to keep up with the fast-moving changes, MPs claim. “The government should be more active and have a much more holistic strategy to make sure this new technology has the maximum effect,” Ellman said. Speaking to the BBC, Ellman said questions over liability in the event of a collision with a driverless car remain open. “Who is liable? Is it the manufacturer of the vehicle, or the technology in it? Is it the driver?” she said. “We are working closely with industry to progress driverless car technology, demonstrated by our recent announcement that the UK is uniquely positioned to lead the way in safely testing these vehicles on public roads,” he added. MPs also recommend driverless technology firms should be encouraged with tax breaks in order to prevent Britain falling behind the US, Japan, China and Germany. Several cities in the UK are currently testing self-driving cars as part of a government funded scheme. 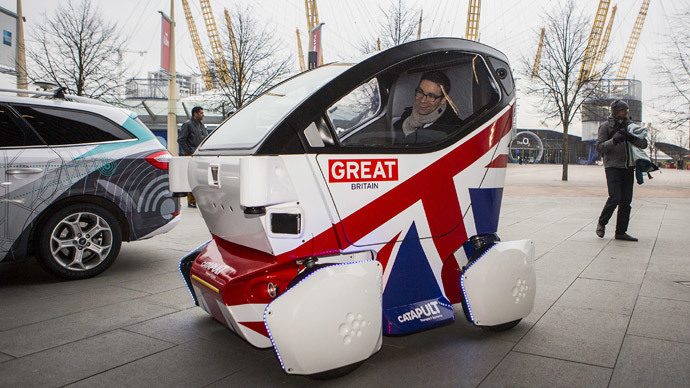 Dubbed Innovate UK, the program has received £19 million from taxpayers to develop autonomous vehicles in London, Bristol, Coventry and Milton Keynes. In London, the Transport Research Laboratory (TRL) consultancy is testing driverless shuttle cars and autonomous valet parking in cooperation with a collection of motoring associations. The UK Autodrive program in Milton Keynes and Coventry is testing driverless cars on roads and self-driving pods. Driverless cars in Bristol are being assessed by the Venturer consortium for their potential to improve safety and reduce congestion, as well as their impact on insurance companies.